It's Sunday again. Time for another attempt at playing the organ at church. I had high hopes that today would be much better than last Sunday; I remembered how to adjust the master volume, plus my kids had proved to me that they knew how to be reverent during Sacrament meeting. All went well during the prelude music. The opening hymn was Scatter Sunshine. If you are familiar with the church hymns and have experience playing some of them, you probably know that while this song isn't particularly difficult, it is a bit more challenging than the bulk of the songs in the hymn book. Particularly on the organ where it's a struggle to know when to connect the notes, or not. So I start playing, and my kids start fighting (Um, hello? Were they not paying attention? They are supposed to be scattering sunshine!). They end up walking up to the organ and fighting while I am struggling to play the hymn. I am now attempting to play the hymn (FAIL! ), watch the chorister (EPIC FAIL! ), and discipline my children (SUCCESS!). I forced them to sit on the stand and be quiet. 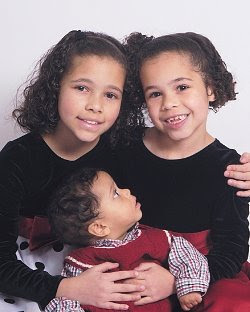 I think they looked like this, except Sara is about 3 years older now. And she was more mad than she was in this picture. And Rebecca was mad too. Today was an example of why I should not be the ward organist. Surely there must be somebody else? Every month I take Matthew to JC Penney's to get his picture taken. They always ask about what he is doing developmentally so that they know the best way to pose him and possibly attempt to capture some of those milestones on film. Several times they asked me if he had discovered his feet yet. The answer was always no. Matthew Jayden has not learned about figurative speech yet. Here he is demonstrating the phrase "Open mouth, insert foot." All of a sudden I am sensing an urge to bath this child more often. But hey, I recognize a blessing when I see one. At least he isn't sucking on MY toes. When I was a child, it seemed like there was plenty of time to play and just be a kid. These days, at least in our household, it seems like those times are few and far between. I find myself grateful that my girls are close in age, because when they do have free time, it's nice to have a built-in playdate. Every once in a while, however, we need to branch out and invite some friends to come over and play. Today was one of those days. I am fortunate that I know several families who just happen to have two girls the same ages as my girls. It makes it easy to have a play date because I can have both girls over to our house, send my girls over to their house, or even swap girls for the afternoon. Everyone has someone to play with and for the most part, we avoid the "left out" feelings that occur when only one child has a friend to play with. The girls had a lot of fun playing with Victoria & Christianna and we hope that they had a good time as well. Matthew turned 9-months old today. He is such a wonderful, sweet, baby! He is generally very good-natured, although lately he has had a bit of a sleeping problem. It's easy to cheer him up, it's easy to entertain him (now that he can sit up), and he is oh-so-easy to smother in hugs and kisses. I love watching him bounce back and forth in time with the music. I love hearing him squeal and giggle. I love his big-mouthed smile. I love his cute little pointy tongue that is almost always sticking out. I love his curly hair and his big dark eyes. I love his long, dark eyelashes. I love his tiny little feet that somehow already manage to get that sticky-sweaty feel that is so common in little boys. I love his curiousity, his hugs, and even his very drooly kisses. I love the way he smiles and squirms in the morning, and the way he moans himself to sleep at night. I love the way he attempts to "eat" everything. I love seeing his delight while playing "Peek-A-Boo" or "Patty Cake" and hearing his squeals when he is lifted high into the air. I suffer from postpartum depression. It is real. It is scary. It is a very dark place to be in, and I have been there for almost 10 years. I have a hard time even remembering what "happy" is supposed to feel like. Did you know that 1 in 8 women suffers from postpartum depression? Get the facts and learn more about it and other perinatal mood disorders. Did you read the article? Does any of it sound familiar? If this is you, get help now. Talk to your doctor about anti-depressants, and find a psychiatrist to talk to. You are not alone. You are not the only person who is struggling with depression. Again, you are NOT alone. not years of sadness. Postpartum depression is real. Get help now. I'm getting my life back on track... why don't you join me? Today was a very exciting day for my brother and sister-in-law. Tim & Kristel got to move into their brand new home. Michael spent most of the day helping with the move, while I assisted with the move by staying home. Trust me, keeping the kids away from this project was a BIG help! No pictures yet, but I trust that Michael was working hard. Today we went sledding at Sugarhouse Park. This year, Sara and Rebecca were old enough to go down the hill by themselves and strong enough to carry the tubes back up the hill by themselves! Matthew didn't seem excited about sledding, but he was content to be pulled around in his little inflatable sled. What a fun day! but he eventually decided to try the hill just one time. but I saw the biggest smiles when they went down the hill together. My two girls working together without fighting! but it was a lot more fun to pull Matthew around in his sled.